Relish that rush-of-wind feeling every time you take a sip with this clever, conversational set of glasses. Pedaling up a hill: triumphant. Zipping down one: completely, utterly exhilarating. Relish that rush-of-wind feeling every time you take a sip with this clever, conversational set of glasses. 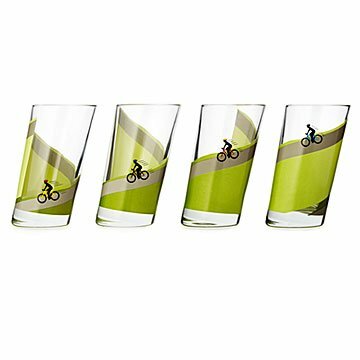 Featuring illustrated graphics of four cyclists, each in a different spot on the hill, the slanting glassware is a fun gift for bike lovers and free spirits who always enjoy the ride. Glassware made in Italy, decorated in Edina, Minnesota. These are heavy weighted and just perfect! You can tell that the glass is high quality and the shape of the glass is very unique. I bought this as a gift for a bike enthusiast, sure he will love them and get a lot of use out of them! Love the tilted glasses! We joke and tell people, "when the glass looks straight, you have had too much"! I hand wash these (I don't know if they are dishwasher safe), but I know from past experience that eventually these types of design will fade. I just wish they were taller. Bought for a wedding gift for couple who love to bike. Perfect for their downstairs bar. I haven't actually seen the glasses in person yet, but my cousin and husband loved them. Very unique, and the themes of biking and skiing were perfect for them.